Theresa May said Friday that the United Kingdom had never felt "at home" while being a part of the European Union. "They [UK people] want more direct control of decisions that affect their daily lives; and that means those decisions being made in Britain by people directly accountable to them. The strength of feeling that the British people have about this need for control and the direct accountability of their politicians is one reason why, throughout its membership, the United Kingdom has never totally felt at home being in the European Union," May said in Florence during a speech devoted to Brexit. "And perhaps because of our history and geography, the European Union never felt to us like an integral part of our national story in the way it does to so many elsewhere in Europe," May added. 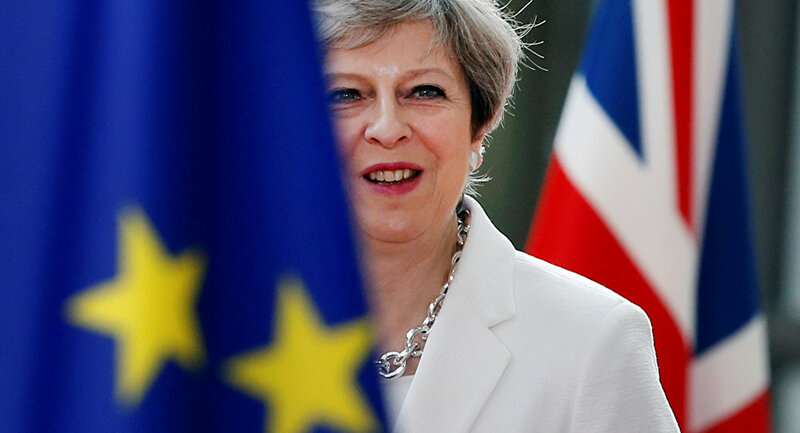 The United Kingdom will terminate its membership in the European Union in March 2019, after which it is planned that the United Kingdom and the European Union will be adjusting the new regulations during a two-year transition period, May said. "The United Kingdom will cease to be a member of the European Union on 29th March 2019… It is also the case that people and businesses – both in the UK and in the EU – would benefit from a period to adjust to the new arrangements in a smooth and orderly way… As of today, these considerations point to an implementation period of around two years," May said. The UK prime minister also indicated that the unfortunate result of the negotiations between the European Union and the United Kingdom will be bad for the future of Europe. "For we should be in no doubt, that if our collective endeavours in these negotiations were to prove insufficient to reach an agreement, it would be a failure in the eyes of history and a damaging blow to the future of our continent," May indicated. May believes the country and the European Union were able to negotiate a better model of a new economic partnership between them after UK's withdrawal from the bloc than the ones based on the European Economic Area (EEA) or EU-Canada free trade agreement. "One way of approaching this [new economic partnership] question is to put forward a stark and unimaginative choice between two models: either something based on European Economic Area membership; or a traditional Free Trade Agreement, such as that the EU has recently negotiated with Canada. I don’t believe either of these options would be best for the UK or best for the European Union," she said. May proposed to reach a new strategic agreement between London and Brussels in order to ensure EU-UK security, law enforcement and criminal justice cooperation after Brexit. "To keep our people safe and to secure our values and interests, I believe it is essential that, although the United Kingdom is leaving the European Union, the quality of our cooperation on security is maintained… So we are proposing a bold new strategic agreement that provides a comprehensive framework for future security, law enforcement and criminal justice co-operation: a treaty between the United Kingdom and the European Union," May said. The UK politician added that the issue of terrorism was among the challenges that could only be resolved in cooperation with the European Union. The United Kingdom wants all EU citizens residing in the country to stay, according to May. "I want to repeat to… all EU citizens who have made their lives in our country – that we want you to stay… I want to incorporate our agreement fully into UK law and make sure the UK courts can refer directly to it," she said. "We may be leaving the European Union, but we are not leaving Europe… I look ahead with optimism, believing that if we use this moment to change not just our relationship with Europe, but also the way we do things at home, this will be a defining moment in the history of our nation," the prime minister stressed. May pledged to adjust the EU legal agreements with the national system and keep reference to the rulings of the European Court of Justice (ECJ) in the cases affecting the European nationals after Brexit. "I know there are concerns that over time the rights of EU citizens in the UK and UK citizens overseas will diverge. I want to incorporate our agreement fully into UK law and make sure the UK courts can refer directly to it. Where there is uncertainty around underlying EU law, I want the UK courts to be able to take into account the judgments of the European Court of Justice with a view to ensuring consistent interpretation," May said. The prime minister added that London and Brussels would need "a strong and appropriate dispute resolution mechanism." May noted that the access to each other’s markets should continue on the existing EU terms. "During the implementation period access to one another’s markets should continue on current terms," May stated. If the "difficult" negotiations fail, it will be a damaging blow to Europe's future, May opined. ​The third round of Brexit talks between the UK and Brussels was held in early September. According to UK Secretary of State for Exiting the European Union David Davis, the parties have managed to achieve "concrete progress." However, Barnier has repeatedly expressed skepticism over the lack of progress. In late March, the United Kingdom officially launched the EU withdrawal process. The Brexit negotiations between London and Brussels, which started on June 19, are expected to conclude by the end of March 2019.